Cereal of the future; less cardboard, but could it mean more plastic? I’ll be interested to hear your thoughts on this story by Roger Waite in the Times yesterday. Sainsbury are planning to reduce packaging on their cereals by ditching the cardboard box! Instead they will print all product information on the plastic inner. “THE breakfast table is about to become a little less cluttered. 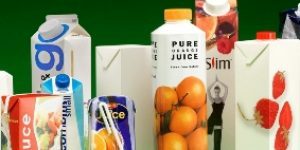 Sainsbury’s is the first supermarket chain to banish the cardboard cereal box – and has started selling milk in polythene bags. The step, which ends a century-old tradition, will help to cut packaging on its entire range of products by a third. The supermarket now plans to sell its own-brand cereals in recyclable plastic packets similar to those used for crisps. Kellogg’s, the biggest cereal manufacturer in the world, is considering following suit. Its dilemma, however, is whether the packaging will prove sturdy enough to protect Corn Flakes and Rice Krispies from being ground to dust by the time a customer returns home from the shops. Consumers are becoming increasingly frustrated with the excessive levels of packaging of some items, such as Easter eggs or pizzas, which are routinely wrapped in layers of plastic and cardboard. “I’m sick and tired of having to take a chainsaw to packets,” said Martin Salter, a Labour MP who has campaigned against too much packaging. Sainsbury’s polled more than 1,000 customers to draw up a list of the 10 worst packaged products. “When it comes to cereal, our customers asked us why they need to be in a box as well as a bag when you can just print all the information on the bag,” said Stuart Lendrum, the retailer’s head of packaging. The chain has started stocking packets of its basics range of Rice Pops in many stores and hopes to eliminate cardboard boxes for all its own-brand cereals. Read the rest of “Breakfast in the bag as box is binned” by Roger Waite in The Times and share your thoughts with us! Notice how the card is ditched while the plastic remains. This will save the weight of package but remove the recyclable part. This system which is less resilient would indicate container use in the home, where the packs are emptied after purchase. one step towards refillable systems. I welcome the reduced strawberry packs, but expect to be able to recycle the plastic. This will reduce waste for the ordinary consumer as well, which is a positive. Buying loose is even better. Hmm… ‘recyclable plastics’ – but will they really be recycled? That’s the million dollar question, isn’t it?? I’d expect full transparency & them working together with everyone (WRAP, etc) & really helping secure facilities for recycling then!! I agree with John that being able to buy bulk with your own container or sack would be much better!! as for recycling paper vs. plastic – I have doubts about both! the cardboard boxes here are usually laminated & ‘glossy’ & it’s difficult to break down these in the recycling process – it would be great to see any studies on environmental impacts of recycling these vs. the plastic!! To me they would have been better ditching the plastic and keeping the box, as then once decanted the box is easily recycled. If they are using the plastic which their own brand crisps come in it is “not recyclable at present” according to the back of the packet. As for the fruit punnets they should have been replaced with the compostable cornstarch packaging which is used in the Organic Range. At the end of the day they will do whichever is more cost effective to themselves, and will have at least have eliminated double wrapping. @John Costigane: Lose produce is always favourable, but I’ve never seen a supermarket sell lose soft fruit. Luckily, we can buy from a local orchard and he will take back the packaging. As for ditching the cardboard but keeping plastic; that’s a shame, isn’t it? @Layla: You’re right Layla; they will need to improve recycling facilities for this plastic packaging. Such a shame they didn’t keep the cardboard and say no to the plastic instead. @maisie dalziel: We need you on the board of directors, Maisie. I agree with everything you said. There are much better alternatives and although I applaud reduction in packaging, this is a story where to me, the point of the exercise has been completely missed. I have just fired off an email to Sainsburys quoting my grievances with this type of packaging change. Well done Maisie and thanks for the email address – it would be good if several of us joined forces and had our opinions heard. We could compare notes on responses later.